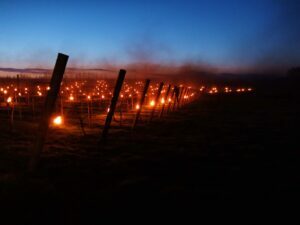 As feared, I’ve been up at 2am for two days so far this week……as the recent cold blast hitting the UK has brought frosty nights threatening severe damage to the young emerging buds and shoots on the vines. 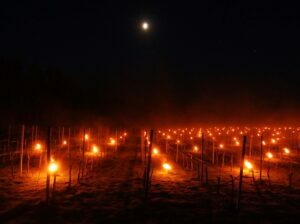 As I watch the temperatures plummet towards zero I force myself out of bed and into the vineyard to light some 700 frost candles (‘bougies’) to help ward off the frost. Dragging with me my new assistant, Mat, and my father in law, John, we stagger around the vineyard in the pre-dawn hours lighting the ‘bougies’ only to return a few hours later, once the sun has risen, to put them out again to conserve their precious resource should we need them another night. The one consolation…it looks amazing! I don’t think I’ve felt this tired since I had young children – and this is perhaps a good analogy – as having nutured and cared for every single one of my 41,000 vines since planting, I am compelled to do something to help them through the frosty nights – even if it means no sleep! It is this type of care we put into the vineyard that we hope is reflected in their exceptional output – our wines…..